The Original Six - Canada's Best Selling Poster? I don’t want to be one of those people who feel it’s their mission in life to tell people how to do things – how to save, how to be successful, how to be happy - my goodness I find that offensive when someone is that full of themselves. But one thing that does guide me as I wiggle my way through life is the thought that we’re probably never as smart as we think we are, nor are we as far off the mark as we might fear - the truth usually lies somewhere in between. With that in mind, I’d like to tell the story of our first poster, The Original Six, which is in all likelihood is one of the best selling posters in Canadian history. It’s hard to say with certainty what the best selling posters are simply because poster sales isn’t a statistic that is kept/recorded. I recently did a fun interview with a wonderful man by the name of Paul Lukas. Paul is the genius behind Uni Watch, an incredible blog/website devoted to what Paul calls “The Obsessive Study of Athletics Aesthetics”, or more simply, a blog about sports uniforms. It’s incredibly popular and the readers of uniwatch are great contributors of uniform bits and pieces – the amount of uniform information in the site is frightening, a remarkable achievement. 1. While I was in university a million years ago (1978-1981), I had a collection of roughly 20 hockey jerseys that I wore around campus. I’m not entirely sure of my motivation for wearing them, if any, but in retrospect I sense it had something to do with being a Canadian going to university in New Jersey and wanting to make it known in some way that I was Canadian, and what better way than wearing hockey jerseys 24/7. I remember hearing someone describe me as “you know, the guy who wears the hockey pajamas”. It was a bit of a dog’s breakfast of a collection of jerseys - some were jerseys that I had as a kid, others were ones friends gave me, and a handful were ones that I bought. The point is that even that long ago, I was somewhat obsessed with jerseys. In 1975 I traded a guy from Sweden a great 1972 Team Canada jersey for this jersey - not quite sure what I was thinking but this is the sort of jersey I wore on a daily basis in university. 2. In an earlier blog, I wrote abut my wonderful grandfather Bert Powell and a great three-volume collection of books he gave me called “The Trail of the Stanley Cup”. These books trace the history of Stanley Cup competition from 1893 to 1967. Remarkable stuff. 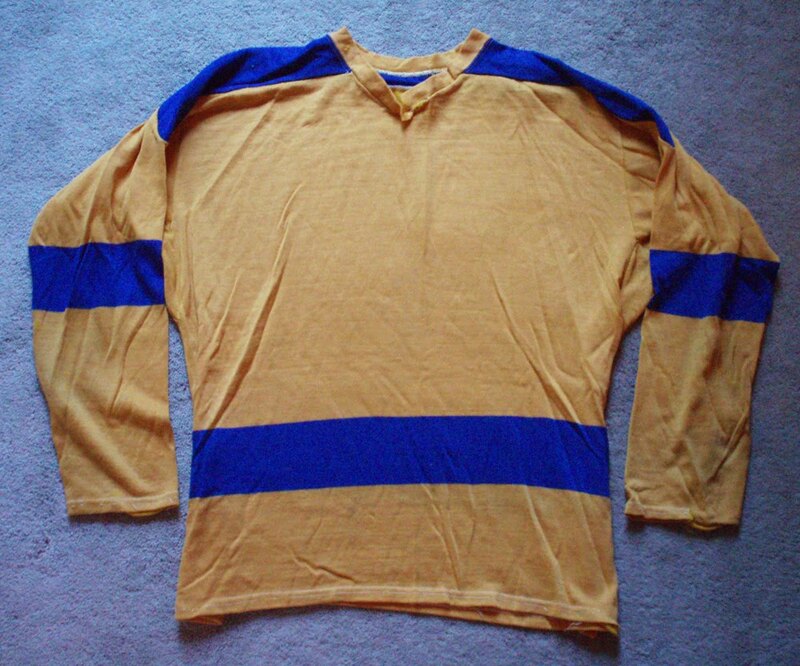 Among a lot of other gems, the books contain approximately 64 simple colour sketches the author Charles Coleman made of great jerseys from the 1890’s through the 1920’s. These sketches stayed in my mind for years and I am certain they played an important role in my interest in jerseys. 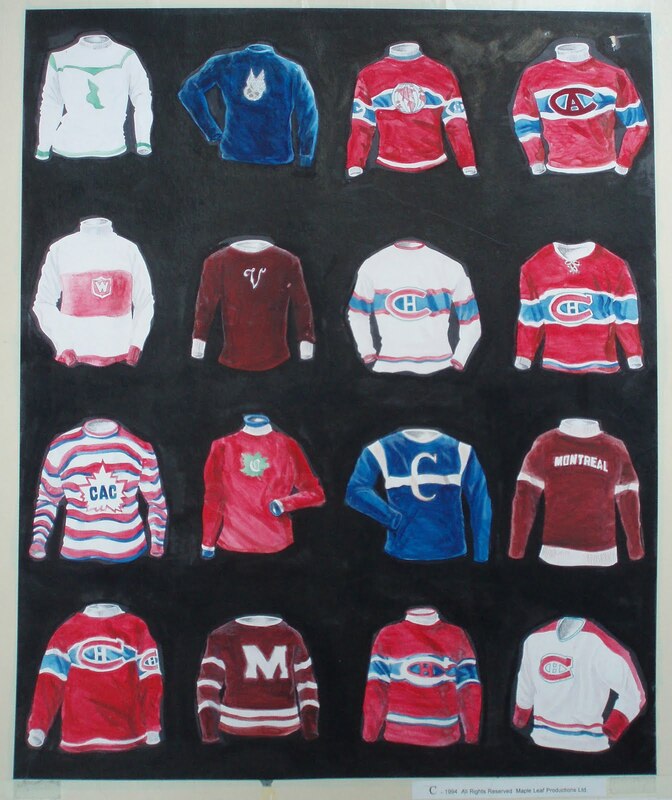 In the late 1980’s, I had the idea of creating two posters - one showing watercolour paintings of historic jerseys of every Toronto-based team that had competed for the Stanley Cup from 1893 to the present, and the other showing Montreal teams. The idea rattled around in my head for some time, and in 1992 I shared the idea with a hockey-mad friend who was looking for a project and we came up with a prototype. 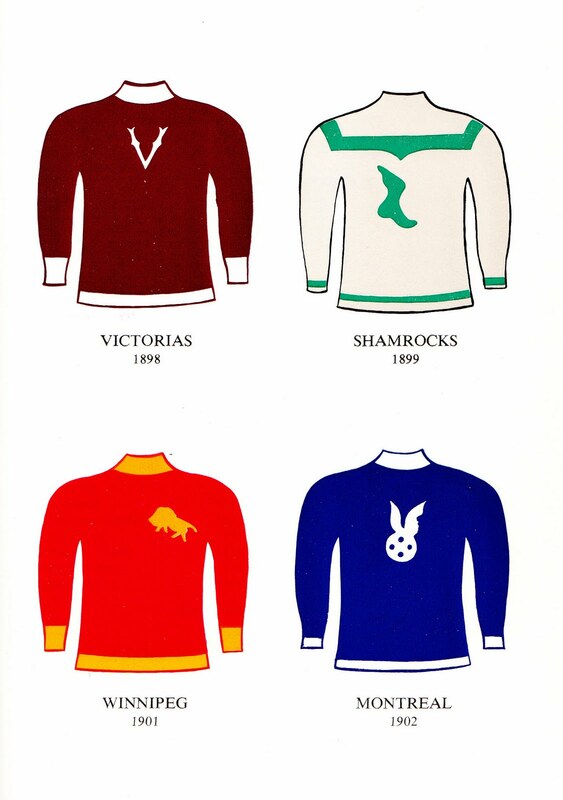 This is the original prototype of our jersey posters - it shows Montreal jerseys largely because Charles Coleman offered more images of Montreal teams than Toronto teams. The idea sat for a couple years. By 1994 I had started my own business, Maple Leaf Productions, and I made the decision to apply to the NHL for a license to produce the historic hockey jersey posters described above. I was turned down. I applied again in 1996 and once again I was turned down. It subsequently came to my attention that there may have been some skullduggery going on between the NHL’s existing poster licensee “Norman James” and the-then person in charge of licensing, and if that was the case, so be it, I guess that’s the way the world works. I was determined to get an NHL license and it was clear I needed a strategy. What I decided was that if I could produce and sell a successful hockey poster, one that didn’t require NHL licensing, when I next applied to the NHL for a license, I would likely be given a far warmer reception. This was 1996. Chicago Stadium had closed in 1994, Boston Garden in 1995 and the Montreal Forum in 1996. This left Maple Leaf Gardens as the last of the Original Six arenas – the last one standing. So my poster idea was to create a poster honouring the six great arenas of hockey once again using artistic renditions, not photographs. The idea then morphed into producing two virtually identical posters – one called “The Original Six” and the other called “The Last The Best of All”. Both posters would show all six arenas, but in the “The Last the Best of All” poster, Maple Leaf Gardens would be in colour to reinforce the fact that it was still “alive”, and from a Toronto perspective, “the last the best of all”. Note the poster title we initially contemplated - a bit wordy! In my mind I was fairly certain that of the two posers, “The Last The Best of All” would be the most popular. Of course I was dead wrong – The Original Six went on to become a best-seller and The Last the Best of All was forgotten fairly quickly. As I said, you’re never as smart as you think you are. Incidentally, if you have one of The Last The Best of All’s, hang on to it – it’s rare (so rare that even I don't have a good electronic copy of it to show you)! It turns out that one thing I wasn’t so far off the mark with was that 18 months later, when I applied for an NHL license with a now-successful poster under my belt, the NHL granted me a license. And that’s the story of The Original Six, one of the best selling posters in Canadian history. A. It should be noted that the third time I applied for an NHL license, the gentleman who had been in charge of NHL licensing, the one who may have had too close a relationship with the Norman James Corporation, was no longer in the employ of the NHL. B. Once we became an NHL licensee, we re-published the Original Six poster using NHL team logos and they made the poster that much more appealing – I really think it completed the poster. But I’d like to tell you about the logos we used in this poster. The NHL didn’t give us these logos as is usually the case – at the time the NHL didn’t have any vintage logos to give licensees. Instead, I had a copy of a terrific glossy NHL licensed products booklet that the NHL and their then-licensing director Fred Scalera produced in 1993-ish. This booklet was brilliantly produced and had some great vintage logos among many historic photos and other images. We scanned those logos using the highest resolution equipment we could at the time (a monster drum scanner) and re-created those logos electronically. The NHL liked the logos so much that they ended up asking us for the logos. And as far as I can tell, these images are still in use by the NHL today – all scanned from Fred's NHL product booklet. These are the logo images we scanned from Fred Scalera's great 1993-ish NHL product booklet. C. Our poster was titled “The Original Six”, an expression that was part of the public domain at the time. A few years later, the NHL licensing department demanded (and I use that term deliberately) that I sign a document disavowing any claim I may have had to that expression. What an impossible situation for a licensee to be put in – if I wanted to retain my NHL license, I had no choice but to sign. In my opinion, being a bully is not the way to run a business. And now thus it is that any time you see the expression “The Original Six”, you’re likely to see the ubiquitous TM close by. We issued our second news release in as many weeks yesterday using a number of online news release services and I wanted to share some of the contents with you. The news release headline is "Entrepreneur is a Living Example of the 10,000 Hour Rule". 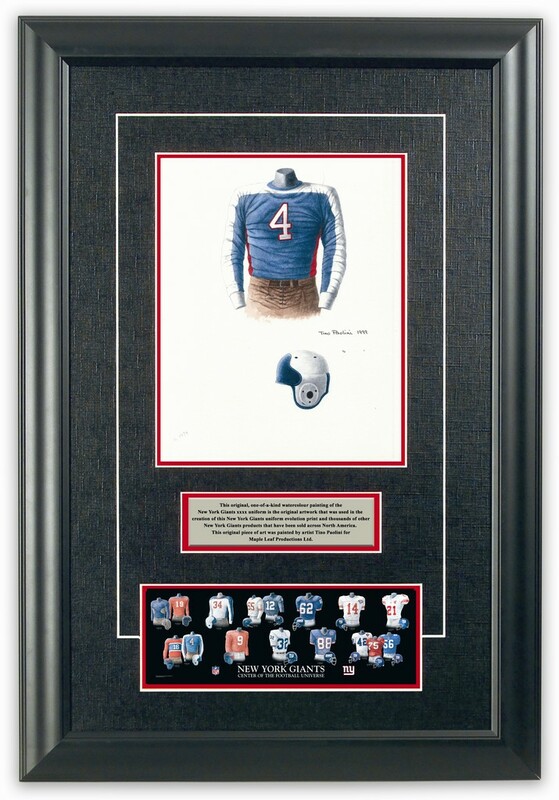 The release is designed to help promote the fact that more than 1500 of our hand-painted watercolor paintings of football, baseball and hockey uniforms are being made available for sale for the first time. The 10,000 hour rule you ask? Social commentator and writer Malcom Gladwell (author of Tipping Point, Blink and Outliers) writes in his 2008 book Outliers that the key to success in almost any field is practicing a specific task for at least 10,000 hours. My point is that I think I somewhat prove his thesis in that I spent almost fifteen years researching NFL, MLB, NHL, CFL and NCAA college football uniforms, the result of which was the creation of a treasure trove of more than 1500 hand-painted watercolor paintings of football, baseball and hockey uniforms. The news release made the point that I enjoy dreaming of ideas AND doing my best to make them happen. The release uses the example that when I learned that the Montreal Forum was going to be torn down in 1996, leaving Maple Leaf Gardens as the last remaining arena of the “Original Six” NHL teams, I got to work honoring the great arenas of hockey with the best selling poster “The Original Six”, a poster that sold well over 350,000 copies. Since that eureka moment almost fifteen years ago, I spent well more than 10,000 hours researching the history and evolution of stadiums, ballparks and arenas and especially uniforms of teams from the NFL, MLB, NHL, NCAA college football and CFL, and thus find myself as a "uniform expert". I know it sounds like I'm blowing my own horn, but the truth of the matter is that this may be one of the best selling posters in Canadian history, something I am very proud of. Please note: In my next blog, I'll tell the story of this, our first, poster. For the record, over a period of almost 15 years, I researched and gathered vast amounts of source material which I then provided to a small team of highly skilled artists. In turn, the artists took the research and created highly detailed watercolor paintings based on the research material. I also am a meticulous record keeper, and I have research files for every single season of every NFL, MLB and NHL team and many NCAA football teams. In all, I have more than 10,000 file folders full of newspaper clippings, photographs, photocopies, trading cards, media guides and much more. Prices range from $350 up to $1000 per piece (US$) with the vast majority of pieces starting at the $350 price. These prices include UPS delivery in North America. The news release also makes the point that these pieces would make an ideal gift for any sports fan – anniversary gift, retirement gift, major birthday gift, graduation gift, wedding gift. 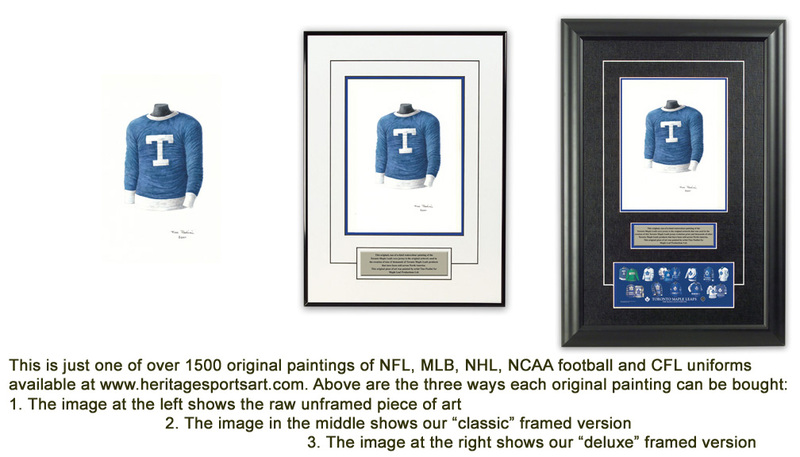 Or a sports fan could buy it as a gift to themselves because they want to own a piece of history that celebrates their team and their fandom. This art is unique and one-of-a-kind, and unlike a good deal of sports art, it is very tasteful. The news release closes with the oft heard refrain: To view and/or purchase any of the more than 1500 pieces of original art being offered for sale, please visit the website devoted to the sale of this artwork. This site allows fans to search by team name, or city, or even championship winning teams. Or fans could visit Sillcox’ “Heritage Sports Art” YouTube Channel or simply search YouTube for their favorite team and add the words “uniform art”. These videos explain in depth what is being offered for sale and viewers can get a great sense of the original artwork. Or fans could read Sillcox’ uniform and stadium history blog where they can learn more about a particular team’s uniform and stadium history.